An artistic pose taken in 1906. This RPPC was posted July 8 from Niagara Falls. These two wanted to try something different. Why not pose with our backs to the camera? The shot gives an effect of secrecy and camaraderie. Unidentified man with leather cuff and Ed Huskell. RPPC. Private Collection. Of course, what I noticed first is the greatly detailed leather cuff. Was it purely a fashion statement, or did it have a more practical use? The unidentified man with the cuff is posing with his left arm on Ed Huskell (or Hushell)’s shoulder. The pose is casually affectionate with Ed leaning into his friend. Ed is IDed on the back as the husband of Stella, and father of Beatrice (1912), Lonnie (1913), Flo Etta (1915), Phyllis (1917) and David McKeith (1924). McKeith does seem like a strange choice for a middle name. Bill Hall & Jim Pollen. Tiajuana Jail RPPC. Private Collection. Pretty boy Bill looks like he hit something hard with his right hand. This 1910s-1920s drinking duo. RPPC. Private Collection. There is closeness between these two. The worker on the right still has the cap on his beer, and his expression…He looks tired or buzzed or both, but still he seems self aware and smiling in that ‘you know it’ sort of way. The other one is in a suit, chugging the (whiskey?) bottle hard and holding a pipe with a free hand…There is a ‘devil may care’ attitude with this handsome duo, a subtle vibe of rebelliousness! I also love the way the gent on the right is wearing his checkered cap sideways on his head, very street mutt. ;) He must have been a factory or farm worker still wearing his denim shirt and pants after a long day of work. 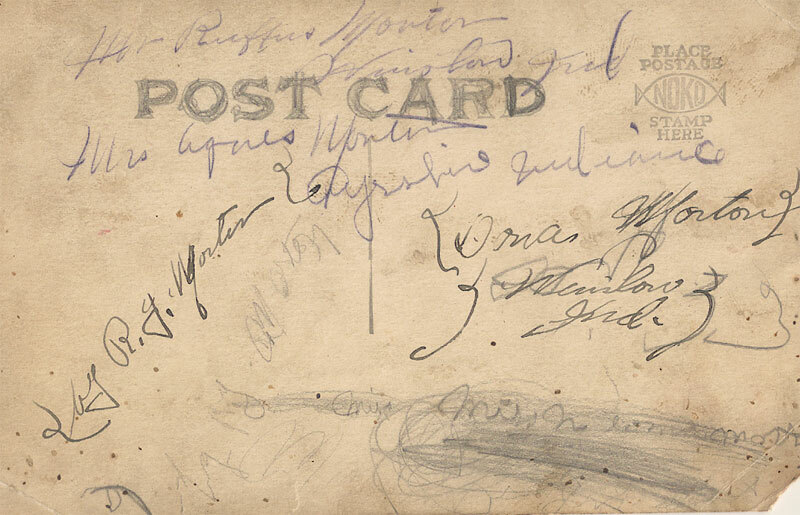 The back of this RPPC is full of scribbled names, some paired up. I cannot make sense of it. Some names are repeated twice. An Agnes Worter is mentioned as well as a Ruffus Worter and a Winslow. On the actual picture I edited out a B on top of each sitter’s head – brothers? They most definitely were, in blood or not! Two with ferns. RPPC. Private Collection. I remember seeing footage of families waving fern at departing WWI soldiers. Fern is a strong symbol of protection and the love and care of family and community. These two look close and each have fern in their hand. The gent on the left reminds me of Liam Neeson. Edwardian crossdresser couple. RPPC. Private Collection. The sitting man looks serious yet the crossdresser isn’t afraid to smile. An interesting picture from the 1910s raising more questions than it answers.